Mountains of data promise valuable insights and innovation for businesses that rethink and redesign their system architectures. But companies that don’t re-architect might find themselves scrambling just to keep from being buried in the avalanche of data. The problem is not just in storing raw data, though. For businesses to stay competitive, they need to quickly and cost-eﬀectively access and ...process all that data for business insights, research, artificial intelligence (AI), and other uses. Both memory and storage are required to enable this level of processing, and companies struggle to balance high costs against limited capacities and performance constraints. The challenge is even more daunting because diﬀerent types of memory and storage are required for diﬀerent workloads. Furthermore, multiple technologies might be used together to achieve the optimal tradeoﬀ in cost versus performance. 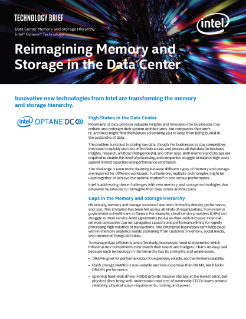 Intel is addressing these challenges with new memory and storage technologies that empower businesses to reimagine their data center architectures. Shows how this built-in feature of the Intel® SSD Professional Family can quickly erase data and encryption keys. Intel® Xeon® processors and other Intel® technologies help Yahoo* cloud storage handle increased demands.